We went up into the front-line near Arras, through sodden and devastated countryside. As we were moving up to our sector along the communication trenches, a shell burst ahead of me and one of my platoon dropped. He was the first man I ever saw killed. Both his legs were blown off and the whole of his face and body was peppered with shrapnel. The sight turned my stomach. I was sick and terrified, but even more frightened of showing it. That night I had been asleep in a dugout about three hours when I woke up feeling something biting my hip. I put my hand down and my fingers closed on a big rat. It had nibbled through my haversack, my tunic and pleated kilt to get at my flesh. With a cry of horror I threw it from me. 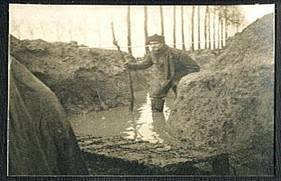 I have never seen a drearier sight than the front of Ypres -- churned up mud with mucky shell holes and never a tree as far as the eye could reach. It was necessary to march single file on duck walk because of the mud for a distance of five or six miles when going in for a tour. We were machine-gunned and bombed from the air and subjected to a terrific shelling on the way in and nothing like a real trench system was possible, the line being held by a series of posts in shell holes. It is Saturday Dec 4th 1915. Marching to trenches 4.10, dusk, shells bursting, someone says, boys it is Saturday night. 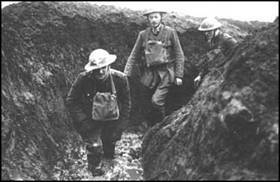 Men coming out of trenches up to their thighs in mud. 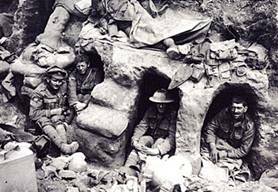 Reached trenches 5.30 bullets & shrapnel bursting over our heads, slept in Dug Out, lying with legs over one another & hundreds of rats as big as rabbits crawling all over us, biting holes in Haversacks for our rations. Sunday morning 8.30am men expose themselves & shell bursts within two yards of us boys hitting man in the stomach. We are served out with Gum boots, which reach to our thighs & fasten to belt round our waist. March through communication trenches, up to our thighs in mud & water, often times above our thighs, water running into gum boots, takes 2 hours to reach firing line, only 500 yards distance, enemy firing over us all the time. Firing line worse than anything imaginable standing in waist in mud & all dug-out fallen in, two men killed in one dugout. Heavy Shrapnel firing and enemies snipers continuously popping at us, but without success.